engineering breakthroughs in camera, speaker and sensors. Vivo is unveiling its new APEX™ FullView™ concept smartphone which sets new benchmarks for future smartphone design, featuring the world’s highest screen-to- body ratio and Vivo’s ground-breaking Half-Screen In-Display Fingerprint Scanning Technology. 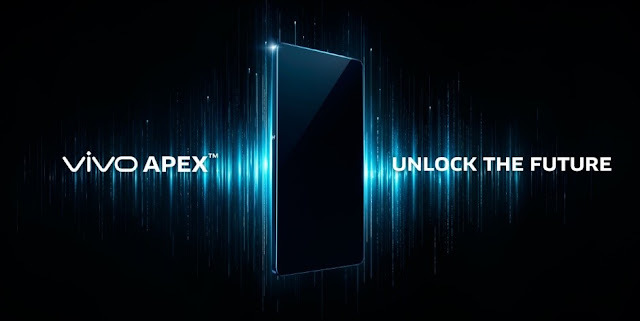 Technology on APEX™, building on the success of industry’s first mass-produced In-Display Fingerprint Scanning Smartphone X20 Plus UD. The APEX™ features unprecedented top and side bezels of 1.8mm-- the thinnest in the industry, with a 4.3mm bottom bezel. The screen-to- body ratio will exceed 98% if the bottom bezel reaches 1.8mm, ultimately creating truly bezel-less experience. Thanks to the flexible OLED platform, microchips mounted directly to the flexible circuit board enables the APEX™’s staggering screen-to- body ratio. In keeping with the promise to continuously support user habits, APEX™ also features an 8MP Elevating Front Camera. The camera seamlessly rises in 0.8 seconds when it is required and retracts after use. Together with the hidden proximity sensor and ambient light sensor, this eliminates the space taken up by conventional front cameras, while offering the same selfie experience to users. Following the success of In-Display Fingerprint Scanning Technology at CES 2018, Vivo has installed the world’s first Half-Screen In-Display Fingerprint Scanning Technology in the APEX™. Transforming the entire bottom half of the OLED screen, users can touch anywhere on the bottom half of the screen to perform fingerprint recognition, enabling a more flexible and intuitive experience while meeting industry standards for security. Half-Screen In-Display Fingerprint Scanning Technology also enables new usage scenarios, such as the new dual-fingerprint scanning feature in APEX™ for even greater strengthened security. previous Xplay6. As this frees up more space in the smartphone’s interior, this technology can allow for increased battery size as well as cooling, thus opening potential for even more design improvements in future smartphones.